TRiO Restaurant & Market is vibrant dining and retail destination with an inviting upscale casual vibe that sets it apart from other venues on the Outer Banks. With both an eclectic restaurant and gourmet market, TRiO offers the best from the worlds of food, wine, beer and cheese for your enjoyment, either on the premises or in the comfort of your home. In the retail shop you’ll find a thoughtful selection of gourmet foods, wines from around the corner and around the world, nearly every style of craft beer and artisanal cheeses hand-cut to order. The restaurant serves casual fare with local and international influences for lunch, dinner and late night. Choose from salads, Panini, cheese boards, small plates and mains featuring fresh, regional ingredients. The beach’s largest selection of rotating craft brews awaits you at their copper-top bar. The extensive wine choices include nearly 30 wines by the glass, an inspired bottle list and twenty-four bottles of wine are presented in self-service tasting machines where you can sample wines priced from $10 to $100 per bottle for as little as $1 per taste! 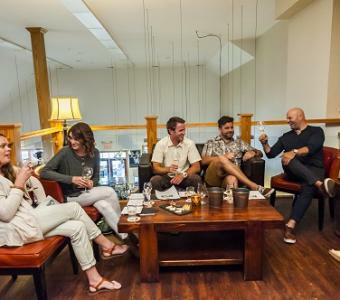 In the upstairs mezzanine you’ll find comfortable lounge seating and a tasting bar where you can enjoy weekly wine, beer or cheese tastings or host a private event. TRiO also offers live music several nights a week featuring local artists playing everything from jazz to bluegrass to rock. 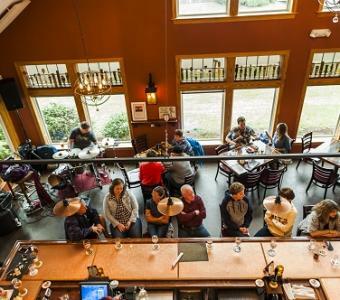 Thursday and Saturday evenings at 6:30 p.m. Join us for these fun and educational tastings where you’ll have the opportunity to taste seven wines and learn about wine styles and regions. Wines are paired with artisan cheeses and cured meats. Space is limited and advance registration is required. Call us at 252.261.0277 to make your reservations.